Connecting Python to MySQLs is as simple as installing a library. Connect to your database and send SQL commands. Hey everybody!, today we are going to talk about how to connect Python 3 with your MySQL database. This is going to be a somehow long post, but don’t be scared, 75% of it is setting up a database for the examples bellow. If you already have a database, you will see a little message that is going tell you what to skip. If you are new or don’t have a database set up, I recommend you to read the entire post. If you are having troubles leave me a comment. I will do my best to help you. Why no make it multiplayer? Sure, why not? Like any of you, when I decide to start a new random project, the first thing I do is to make some fast research, aka Google it. Unfortunately, none of the result where working. I tried many different libraries, but none of them where for Python 3. Everything was outdated and many were even wrong. So here I am, making this simple blog post, to save you many hours walking around the web without any direction of where to go. Hope it helps you, enjoy it! Let’s start by creating a simple MySQL database. It can be hosted anywhere you like, localhost or external (this is the option we will use here). If you already have a database created, you can skip this section. The fastest way to create our MySQL database to for testing purpose is to make it in www.freemysqlhosting.net. Just click, Start my free account, register and done. Once you are done, go to www.freemysqlhosting.net/account/. There, select the location of your database (just pick any, not really important in this tutorial). Next, create your database. Once your database is created, you should receive an email with the authentication you are going to need (make sure you DO NOT delete it). Inside the email there is a link to phpmyadmin, click it. To login into your phpmyadmin account, just fill all the fields with the data received in the email. Now it’s time to create our table. We are done for now, you can move to the Python section. We just set up everything we are going to need for this tutorial. Now it’s time to get your hands dirty. The first thing we are going to need (and probably the only requirement) is to install the library that is going to help us connect with our database. To do that, we are going to use PyMySQL. The library repository can be found here: PyMySQL in Github. Let’s take a look at the minimum piece of code. All this does is to retrieve the database version, enough to check if everything is working as expected. At the bottom I will make a detailed explanation of how it works. Keep in mind you must change the configuration section with your database credentials. If you run this, and your database credentials are correct, you should see the console print your database version. If it worked, congratulations, you are already done with the hard part. If you can’t make it work don’t hesitate to leave a comment, I will do my best to help you. Well, now that we know everything is working, it’s time to start saving data to it. As always, I will paste the code and explain it at the bottom. If you run this code, you will see that new row has been added to your database. This case is pretty similar to INSERT. We are going to do a simple example with SELECT, but you can use any SQL command. 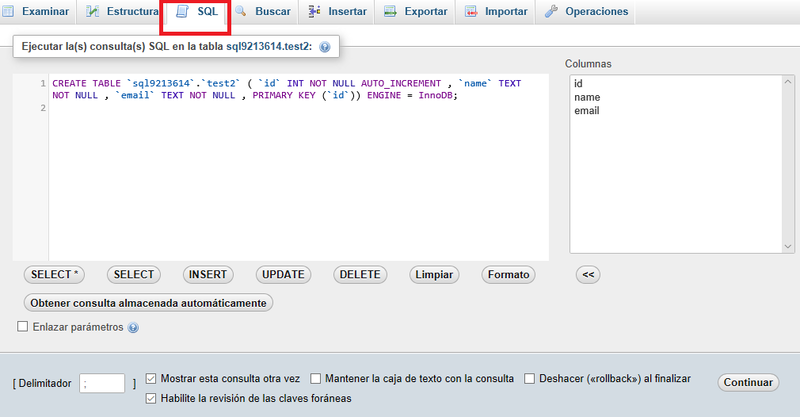 # Prepare SQL query to READ a record into the database. That’s all. Make sure you have something already written in your table or nothing is going to return. I think you are getting how this works, you can use many other database commands, like DELETE. All follow the same logic, but for more details don’t forget to check PyMySQL documentation. Despite the fact MySQL is a really old database technology, it’s still being used everywhere and with the help of Python 3 you can create really simple and fast apps. Unfortunately, I had other troubles to finish my pong game (database connection takes around 1 second to establish making the game lag), but that’s another story.